Though I haven’t written about it on hoopla before, I’ve watched all of ‘Cardcaptor Sakura’ in recent years. In fact, you can go and read this piece on Den of Geek to learn about the show proper. Suffice to say that it works wonderfully as a version of ‘Buffy the Vampire Slayer’ for younger viewers. 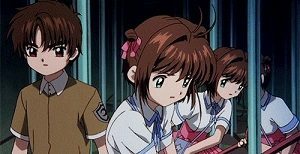 In between season 1 and 2 of the show came Cardcaptor Sakura: The Movie. It was set during the summer holidays and saw the characters holidaying in Hong Kong during a narrative that could easily sit to one side of the main show. The second movie, The Sealed Card, has its job cut out for it: to neatly tie off the loose plot strands that were left dangling at the end of episode 70 of the show. What this really means is some kind of closure for Sakura’s love life, not to mention…umm, actually that’s about it. First off, seeing Cardcaptor Sakura in wondrous widescreen with bigger than usual production values is thrilling in itself. The first movie retained the 4:3 aspect ratio, but this one looks much more impressive on a big TV. Surprisingly, the audio mix (5.1 in both the English and Japanese versions, finally!) is exceptional. It may seem unlikely, but this is the first time in a while I’ve been really impressed by DVD audio, perhaps because you don’t have very high expectations when it comes to this sort of thing. The subtitled text is ugly – huge letters in a strange font, rather than the usual yellow – but this is a small quibble. If only the film had a decent story to fill out the 80 minutes. As is often the case with feature-length sequels to anime TV series (see Blood-C: The Last Dark), The Sealed Card feels like an afterthought. (And would be pointless to watch if you haven’t seen the show before.) In a premise that conjures up memories of Highlander 3: The Sorcerer‘s “oops, there was an Immortal trapped in a cave that we forgot to mention earlier” plotline, it concerns a card that has, up until now, been sealed away from the world. As lame as that sounds, the exciting thing is that it’s easily the most powerful antagonist Sakura (Sakura Tange) has ever faced. As her own powers begin to dwindle, the sense of impending danger is keenly felt. When it comes to Sakura and Syaoran’s (Motoko Kumai) love story, however, the film is less successful. I understand the characters aren’t even out of primary school, but waiting the better part of an hour for Sakura to get over her shyness really grates. The DVD presentation is exceptional, and there’s a ten minute short, ‘Leave it to Kero’ that recalls the fun segments that the little cake-obsessed flying lion (Aya Hisakawa) had back in series 1. The case art means it’ll look great on your shelf next to the rest of your CCS discs, that’s for sure. At the end of the day, there is barely enough material here to fill an episode. In fact, they could have made this episode 71 and I would have been happy. For fans of the show, then this of course is a must, and at least it looks and sounds impressive. Otherwise, there’s nothing else to make it stand out. Cardcaptor Sakura Movie: The Sealed Card is available now on DVD from Madman. This entry was posted in Film Reviews and tagged Action/Adventure, Anime, Fantasy, Romance by Stuart Wilson. Bookmark the permalink.